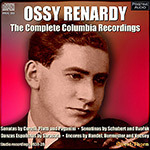 Ossy Renardy was born Oskar Reiss in Vienna on April 26, 1920. Except for some early training given by a neighbor, he was self-taught. He first played publicly at the age of eleven, and two years later toured Italy with a troupe of variety entertainers. His manager suggested that he adopt “Ossi Renardi” as a more Italian-sounding name, which the violinist later amended when he returned to Vienna. Victor de Sabata heard him perform in Milan in 1934, and invited him to play as soloist with the Vienna Philharmonic, which began his international career. He made his American début at a Town Hall recital in New York in January, 1938. Two months later, a few weeks before his 18th birthday, he entered the Columbia studios to make his first recordings. (The Corelli Sonata from that session appears to have been his only Columbia disc to have also been released outside the USA.) In the fall, he returned to the studio with a new accompanist for a series of recordings which would conclude the following March. In October of 1939, he caused a sensation at Carnegie Hall by performing all of the Paganini Caprices in the version with piano accompaniment arranged by Ferdinand David. Early in the following year he went over to the Victor label, where he made the première recording of the complete set of Caprices as well as several short encores (all reissued on Biddulph LAB 061-62, nla). America’s entry into World War II saw Renardy take up American citizenship and join the Army, where he played 490 USO concerts for servicemen. Restarting his career after the war, he signed with Decca in the UK in 1948, where his first recording (and his only one with orchestra) was the Brahms Concerto with Munch and the Concertgebouw (Pristine Audio PASC 013). He followed this up over the next two years with recordings of two unaccompanied Bach Sonatas and a selection of encores, most of which have been reissued on Testament SBT 1292. Returning to America, he made his final recordings for Remington (the Franck and Ravel Sonatas and a new version of the Paganini Caprices, again with piano). He died in an automobile accident while leaving a recital in New Mexico on December 3, 1953. The sources used for the transfers were all first edition “Full-Range” label Columbia shellacs except for the Dvořák items, which came from a pre-war “Gold” label set. While some sides have appeared on previous LP and CD issues, this is the first time the entire series has been reissued since its first appearance on 78s. A flexible, insightful stylist as well as an impressive technician. Urgently recommended. Pristine’s insert provides the dates (all in 1938 and 1939, when the self-taught Ossy Renardy—Oskar Reiss—hadn’t even reached the age of 20), the matrix numbers, and Columbia’s original catalog numbers for the pieces in its collection. Mark Obert-Thorn made the transfers, from “first edition ‘Full-Range’ label Columbia shellacs” and, in the case of Dvořák’s Sonatina and Slavonic Dance, from a “pre-war ‘Gold’ label set;” the 78s appear here in their entirety, according to the notes, for the first time since their original release. Corelli’s Sonata in E Minor represents Renardy’s recording debut; he deploys from its very first notes a tone of commanding vibrancy. That tone and his crisp trills in the first movement, his architectural sense in the second, his natural lyricism in the third, and his stately elegance in the Finale raise the performance above the level of mannered romanticism in pre-historical readings of the works. Renardy’s reading of Giovanni Benedetto Platti’s Sonata in E Minor (possibly a flute sonata, arranged by Philipp Jarnach), with Walter Robert as pianist—as he would be in the rest of the Columbia recordings—displays a similar warmth and refinement in the slow movement. In Carl Flesch’s arrangement of a movement from Handel’s Te Deum, Renardy rises above the ponderous, glowing on the G-string and plaintive in the upper registers. Renardy takes a brisk tempo in the opening Allegro molto of Schubert’s Sonata No. 1, but that doesn’t prevent him from oozing Gemütlichkeit from every one of the music’s pores. He fashions a similarly sympathetic reading of the slow movement without kneading the middle passages’ tempos; and his flashing quicksilver in the running rapid notes makes the finale seem very brilliant indeed, even though he doesn’t deploy electrifyingly crisp off-the-string bowings elsewhere in the movement. Renardy recorded only the last two movements of the composer’s Sonata No. 3—arguably a more developed work—bringing to the Finale an irresistible lyricism. The violinist’s recording of Paganini’s Sonata, op. 3/6—sparkling in its second movement, with bright passagework in the upper registers featuring brilliant, even, left-hand pizzicatos—has appeared in Sony’s release on CD of early recordings by Renardy and Michael Rabin. The recorded sound in Dvořák’s Sonatina seems even more immediate than the generally quiet though vibrant transfers that precede it in the program. Renardy seems to have had an affinity for the composer, in a redolent yet commanding reading of the first movement, a throbbing, nostalgic (yet not mannered) one of the second, a starchy one of the third, and a strutting one of the Finale’s march-like sections. The rhythmic vitality of the Slavonic Dance’s double-stopped sections creates an impression of breath-bating virtuosity. Willy Burmester’s confection, Viennese Serenade, seems charming—a description few have given his works in recent years—and Renardy makes it easy to understand why they once enjoyed such a wave of popularity. Franz von Vecsey’s Caprices have also been largely forgotten (Ruggiero Ricci and others have resurrected Le Vent), but it sounds positively effervescent in Renardy’s reading. Pablo Sarasate’s ethnic compositions also appeared in Sony’s collection (with transfers by Andreas Meyer); but for Pristine, Mark Obert-Thorn has produced a more noise-free, squeaky-clean, and three-dimensional representation of Renardy’s instrument. In Adios, montañas mias, Renardy smolders more darkly than does David Oistrakh (Oistrakh’s reading makes the zortzico seem more like a bonbon by Fritz Kreisler). It’s probably not necessary to repeat, once again, the difference in the way in which Sarasate himself played his works and the way others conceived them; but I will, anyway. So Romanza Andaluza, in this slightly cut-down version, comes across as fiery and passionate rather than cool and elegant. And while the opening sections of Jota Navarra could hardly be more coruscating, the middle section grows languid (though appealingly so) in Renardy’s reading. Zapateado may not radiate so many lumens in Renardy’s version than it does in Sarasate’s own or Jascha Heifetz’s, but it’s engaging in its own way. Not everyone may share the opinion of a violinist I know who reveres Renardy’s performance of Brahms’s Violin Concerto as arguably the greatest of all time, but the collective weight of these early recordings reveals him to be a flexible, insightful stylist as well as an impressive technician. Urgently recommended. This article originally appeared in Issue 37:2 (Nov/Dec 2013) of Fanfare Magazine.